"These are similar to doughnuts but much tastier! 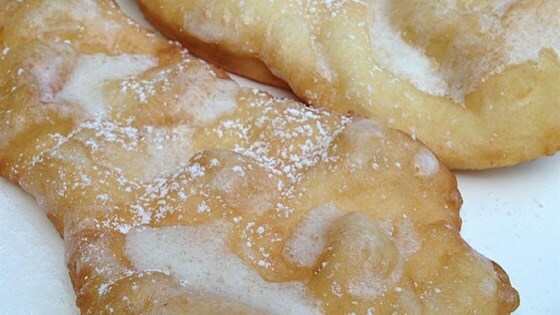 They are usually made on Shrove Tuesday (Fat Tuesday)." Warm the milk in a small saucepan until it bubbles, then remove from heat. Let cool until lukewarm. In a small bowl, proof the yeast by adding the warm water to the yeast. Let stand 10 minutes. In a large bowl mix together the teaspoon of sugar and 3 cups of the flour. Stir in milk until smooth. Add proofed yeast and mix well. Cover and let rise until doubled in size. Stir in beaten eggs, melted butter or margarine, one cup of sugar, salt, and enough of the remaining flour to make a stiff dough. Cover and let rise for a second time until doubled. Punch down dough and divide into 2 portions. On a lightly floured surface, roll out dough to 1/2 inch thickness. Cut dough with a biscuit cutter. Make 2 slits with a sharp knife in the middle of each doughnut. Cover and let rise a third time until doubled in size. Deep fat fry in oil or lard for 3 to 4 minutes on each side until lightly browned. Rotate to ensure even cooking. Drain on brown paper bags. Toss in confectioners sugar while still warm. Go ahead, have a doughnut! These amazing cake doughnuts are baked not fried. Not bad, but soooo long to make. VERY good! Just plan for a little bit of time -- with 3 risings you have to be patient. Also, the size biscut cutter you should use to get the suggested servings (5 dozen) is a 1-1/2". so yummy, next time I will cut the batch in half, it makes a big number of dougnuts. and I would increase the amount of sugar in the dough.